VPN Authority is an attractive VPN option for many reasons. First and foremost, they are a trustworthy and accountable service with a lot of satisfied users. Furthermore, they have been doing business since 2005, so their company is much more mature than newer VPN services. Unfortunately, you have less time to decide if you want to continue using this product. On the flip side, however, you don’t need to pay any money to try it out. While some VPN services offer a 30-day money back guarantee, VPN Authority takes a different approach by allowing you to try their service absolutely free for two days. This VPN service offers an extremely flexible and granular purchase system, allowing you to decide how long you want their service on a monthly basis. 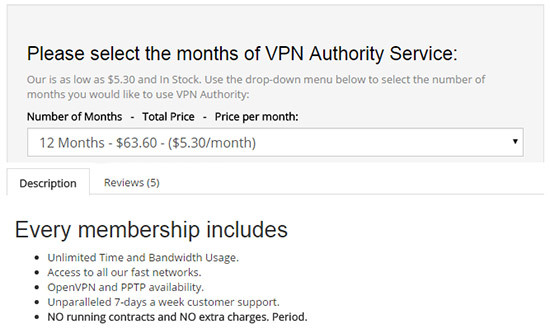 Their competitors commonly offer 1-month, 3-month, and 12-month service plans, but VPN Authority allows you to specify how many months (up to 12) you want their service. As with other types of monthly subscriptions, the more you buy the more you save. The plans start out at 1 month for $7.50 per month all the way down to 12 months for $5.30 per month. With each extra month of service that you purchase, your monthly rate is decreased by 20 cents. You must understand, however, that the speed of your Internet connection will ultimately determine video quality and buffer speed. Many video websites use TCP to buffer video content to ensure that there aren’t gaps in the video and that the video data are played chronologically (via TCP acknowledgements and windowing). However, if you have a slow Internet connection, a VPN could add just enough latency and processing overhead to cause your video to buffer slowly. Although, if you have a modern broadband connection, you’ll be able to watch videos with ease. There is one drawback to VPN Authority when compared with other VPN service providers though. Their VPN servers are only located in the UK, the Czech Republic, Slovakia, and the US, limiting your global connection options. If you are originally from one of these countries or you need to access data or servers within these countries, this VPN is a great and cost effective option. Though VPN Authority doesn’t have VPN servers in numerous countries, they offer very fair pricing, great service, and accountable customer support. They don’t log your data, cap your bandwidth, or charge you recurring fees. If the data you want access to is mostly video content, this is likely your best option. VPNAuthority utilizes PPTP to encrypt traffic with MMPE and uses the RSA RC4 encryption algorithm. Encryption strength options are 40-bit, 56-bit, and 128-bit key encryption. Furthermore, they have connection options to allow for 256-bit encryption using AES-256, which is still cannot be cracked..
VPN Authority is a little different than other VPNs, though. They market their service as the best VPN for streaming video and accessing commonly blocked video content sites such as Hulu, Netflix, NBC, Fox, and other popular video sites. On their site, they elude to some type of server load balancing to ensure that one VPN server doesn’t become a bottleneck if too many users stream data at once. Though they don’t provide information regarding the speed of their network backbone, they certainly guarantee that their service is fast enough for streaming video – one of the most intensive network applications ever. Their philosophy regarding customer service is fantastic at VPNAuthority. They believe that quality customer service is a right – not a privilege. As such, they offer around the clock 24/7 support to help you should you have any technical difficulties.